Using a creative collaborative approach, radiation oncologists at the Montefiore Einstein Center for Cancer Care use stereotactic radiosurgery (SRS) to treat more than 300 patients annually from across the region and the nation. Employing a precisely targeted and highly conformal planning and delivery technique, SRS delivers a lethal dose of radiation to the diseased tissue in a single treatment session while sparing nearby healthy tissue. This makes SRS a viable option in treating small tumors and other conditions that are not amenable to surgery, adding an important new treatment modality to the area of brain cancer treatment. 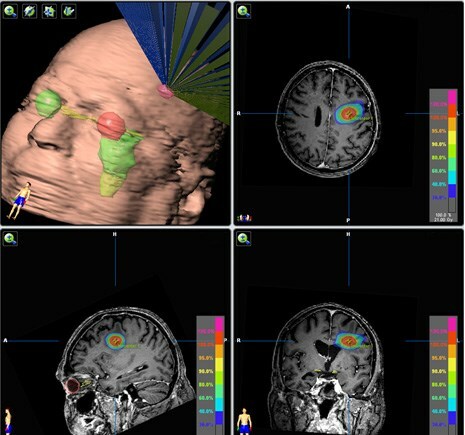 The two main forms of stereotactic irradiation are linear acceleration and the gamma knife. SRS is used to treat brain and spine lesions in addition to lung, liver, pancreatic and prostate tumors. In fact, SRS may be prescribed as the primary treatment for tumors, especially those that cannot be reached by surgery. The precision, as well as the lower amount of invasiveness offered by stereotactic surgical procedures, has been shown to lower the length of hospital stays and the associated costs for certain brain cancers and conditions. SRS is truly multidisciplinary, involving the talents from various medical specialties such as audiology, endovascular neurosurgery, neurology, radiation oncology, therapeutic medical physics, neuroradiology and neurosurgery. The Montefiore SRS team has a combined total of 26 peer-reviewed publications reporting on their clinical outcomes and their technical innovations in stereotactic radiosurgery. Montefiore's Department of Radiation Oncology is the only facility in the Bronx and Westchester that is certified by the American College of Radiology (ACR) to offer this special procedure.